These seem oddly familiar. 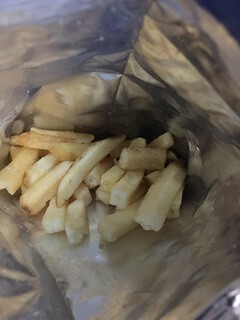 Fries as chips……hmmm… I remember whatafries…here….and smart fries…here…and ruffles crispy fries..here….and now we have WHOLE CUTS, which are the same thing….essentially big potato sticks…which they still make…and I reviewed here…years ago. Now this is not to say that they are bad. They just aren’t new…well…they are for Whole Cuts… but..nevermind. I like that these are larger in size than all the previous versions. They have good crunch too. 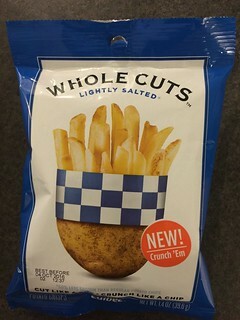 Lightly salted…they just taste like cold fries that are somehow still crunchy. BUT…as you can see when I popped open the bag..there are broken pieces aplenty. Broken pieces and lots of air in that bag. I was hoping for a larger portion size….but whattaya gonna do. But for 1.29 a bag…and several 24 hour burger joints in my area…. I would probably just go get some actual fries if I got a craving.